1 What is Mountain Monsters? 6 When Will Mountain Monsters Come Back On? “Mountain Monsters” was premiered on 22 June 2013 as a part of the network Destination America. It is a television series, best known for finding popularity through its absurd yet intriguing depiction of reality television, and of the supposed monsters they have tracked. How much has the “Mountain Monsters” series accumulated? As of mid-2018, sources estimate a net worth that is over $2 million, mostly earned through a successful run with Destination America. They’ve had their share of problems, but have been able to run for five seasons so far. As they continue airing, it is expected that the income wealth will also continue to increase. “Mountain Monsters” follows the group called the Appalachian Investigators of Mysterious Sightings (AIMS) which is a team consisting of six native West Virginian hunters and trappers. Throughout their journeys, they try to find evidence of and then hunt down unidentified creatures living in the Appalachian Mountains; the system of mountains is located in eastern North America, and is a series of alternating valleys and ridgelines. There are numerous legends and mysteries surrounding the mountain range and the trails within it. Legends have come from Native American tribes as well as from recent hikers and campers in the area. The accounts of monsters or unusual activity have been varied, and reported fom scattered locations all over the mountain range. Abandoned villages, houses, mysterious deaths and reports pf missing people have stretched back to the 1700s, with many people believing that the monsters or ghosts appearing in the area are the spirits of those who long ago lost their life in the mountains. The AIMS team was originally founded by Jeff Headlee, Willy McQuillian and John “Trapper” Tice, and they are joined by three other trappers and survivalists. They use their own brand of research or cryptology techniques, and the goal of their team is to prove the existence of creatures such as the Mothman, Bigfoot, Lizard Man, Hellhounds, and Werewolves. In the beginning of each episode, they discuss the specific creature they are hunting on the way to the location where it was spotted. They then speak to several eyewitnesses to get a better idea of where to begin their investigation. After doing an initial hunt, they then set up traps and search for more evidence. Usually by the second night they are able to procure some sort of photo, audio, or video evidence of the creature, which is supposedly caught on camera, or at times have supposedly even trapped the said creature before it flees. Often times they show blurry images of what they claim to be some of the creatures they’ve been hunting, including the Shadow Creature, Black Wolf, and the Grassman. However, they’ve also encountered another teams who seems to be spying and sabotaging their efforts. 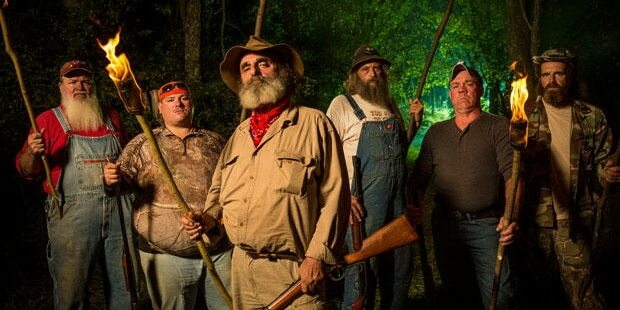 “Mountain Monsters” has had its share of criticisms and controversies with many calling the show over the top. In 2015, one of the team members of the show “Finding Bigfoot” made a tweet calling “Mountain Monsters” a show and fake. The “Mountain Monsters” team then responded by calling “Finding Bigfoot” a show where they can’t find anything. The back and forth comments went for a while before eventually dying down. The team even have their own AIMS website, but researchers have found that the website isn’t run by them but by a company in Arizona which isn’t really related to their team. Many believe the site is just a marketing ploy. The show is called out for being heavily scripted, and that most of its members besides the founders didn’t actually know each other before the start of the show. A lot of people believe that at least two of the AIMS members are actually actors hired to complement the other eccentric cast members. It’s basically common knowledge and belief that a lot of the monsters they document are fake. The fact that the creature seemingly always wins and runs away is a trope akin to a cartoon television series. When Will Mountain Monsters Come Back On? Despite all the criticisms and over the top presentation, many still enjoy “Mountain Monsters” for its entertainment value. Fans have even developed attachments to certain characters. However, the show has been on the verge of cancellation since the second season when the novelty of the show started to drop, causing ratings to drop as well. The show has done gimmicks in the past years such as by using an overarching story line, or putting a theme to the season, but to no avail. The fourth season does have its share of moments, as it had a mix of real life drama due to Trapper having a severe medical condition.